Jonna Simonsson was born on 23th November 2000 in Stockholm. She has been studying the violin since she was six and her pedagogue is Haiou Meng. Jonna has won several awards. 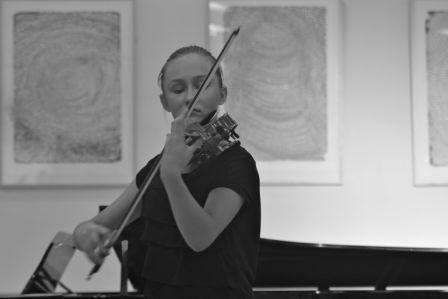 In 2012 she received first prize in solo and chamber at the 2012 International Music Competition in Stockholm and, in 2013, 2 days after she turned 13 she received 2nd price in International Savshinsky Competition (age 13-15 years old). In 2015, Jonna was the winner of Øresunds Solist Competition. She has received several awards and scholarships in Sweden and, in connection to receiving a scholarship from the municipal of Solna; she was honored to play for a couple a thousand people at the Swedish national day. Jonna has performed many concerts in Sweden, Norway, Denmark, Germany and Italy and participated in music festivals such as Båstad Chamber Music Festival, Copenhagen Summer Festival and Young Salomon Smith. Jonna has participated in master classes with among others Alf Richard Kraggerud, Yair Kless, Felix Andrievsky, Mark Messenger, Itzhak Rashkovsky, Brian Dean, Ilya Grubert and Magnus Eriksson. You can listen to Jonna here and here. If you are interested in working with Jonna, please get in touch with the EMCY Office.